Senator Catharine Young (R, C, I – Olean) today joined local officials to praise the designation of the 103 miles of Route 62 in New York State as National Veterans Highway. Signage has been erected on Route 62 at the New York/Pennsylvania state line and in Niagara County to commemorate the designation, which is the result of legislation co-sponsored by Senator Young (S.6277-A) that was signed into law last summer. Senator Young remained hopeful that other states will make similar designations. “I am confident that the nine other states encompassing Route 62 will follow New York State’s lead by honoring our veterans with this special designation so every mile of this highway pays tribute to our nation’s heroes,” concluded Young. Route 62 spans 103 miles in New York State beginning in Niagara County and ending in Chautauqua County before continuing southwest 2,131 miles to El Paso, Texas. "I consider it a privilege to recognize our Veterans by the dedication of this portion of New York State Route 62 in Chautauqua County," said County Executive Greg Edwards. 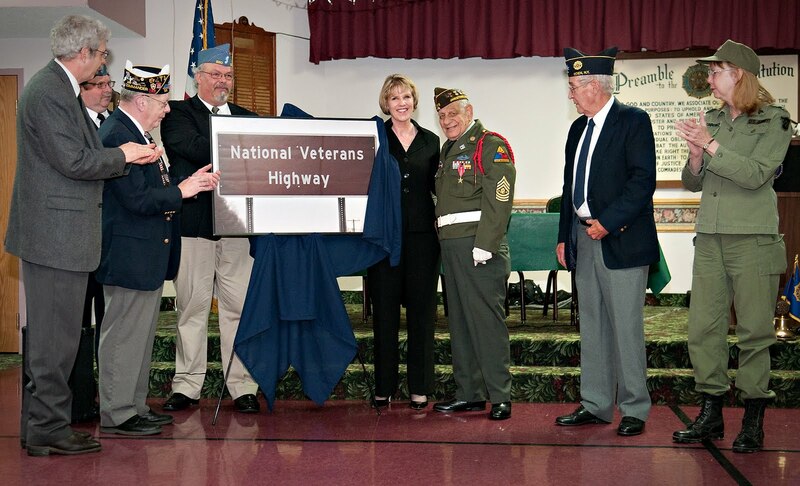 "It is my hope that by the placing of this sign naming this much traveled route, "National Veterans Highway" we will pause to remember and thank all of the men and women who have served, or are currently serving our Country. I would like to once again express my commitment to assisting the over 11,000 veterans living in Chautauqua County." County Executive Edwards went on to say, "I would like to thank Senator Young for her tireless support of our Veterans evidenced by her co-sponsorship of the legislation which makes this worthy dedication possible." Pictured (top), Assemblyman Andrew Goodell, Bob Reed (Chaplain, Sons of the American Legion Squadron 880), Commander Walt Sedlmayer (New York State, 8th District), Commander Ken Szal (Sons of the American Legion Squadron 880), Senator Catharine Young, Anthony Costanzo (WWII Veteran), Commander Tom Tighe (Newell Faulkner American Legion Post 880), Commander Karen Cummings (Samuel L. Derby American Legion Post 556).